Bremen - Franck Ribery scored twice as FC Bayern München chalked up yet another Bundesliga best-mark courtesy of a rampant 7-0 win away to SV Werder Bremen. Assani Lukimya’s own goal set the Bundesliga leaders on the road to victory, with further strikes from Daniel van Buyten, Ribery (two), Mario Mandzukic, Thomas Müller and Mario Götze stretching head coach Pep Guardiola’s unbeaten season start to a record-breaking 15 matches. Mandzukic had the ball in the net just three minutes into the contest, only for the linesman to rule the Croatia international offside. Bremen failed to heed the warning, but again the match official intervened, with Götze adjudged to have fouled goalkeeper Raphael Wolf after dancing through on goal. Robin Dutt’s men certainly didn’t hold back, as Eljero Elia warmed the palms of Bayern stand-in captain Manuel Neuer, before Bayern got the breakthrough opener at the third time of asking. Back in the starting line-up following injury, Ribery did the hard work, bamboozling the Bremen back four and rifling in a wicked low cross, diverted into his own net by the unwitting Lukimya. Die Grün-Weißen’s afternoon turned sour six minutes later when van Buyten rose completely unmarked to head home his first Bundesliga goal since November 2011 from a Toni Kroos free kick, with the points effectively wrapped up before half time after Götze and Müller combined to tee up Ribery for his ninth competitive goal in 12 fruitful outings against the crestfallen hosts. It was a case of normal service resumed after the restart as Götze threatened a fourth, before Wolf was called into action to keep out Mandzukic. Bayern’s No9 was not to be denied, though, stroking home at the far post on the hour-mark following a trademark jinking run and cross from puppet master par excellence Ribery. 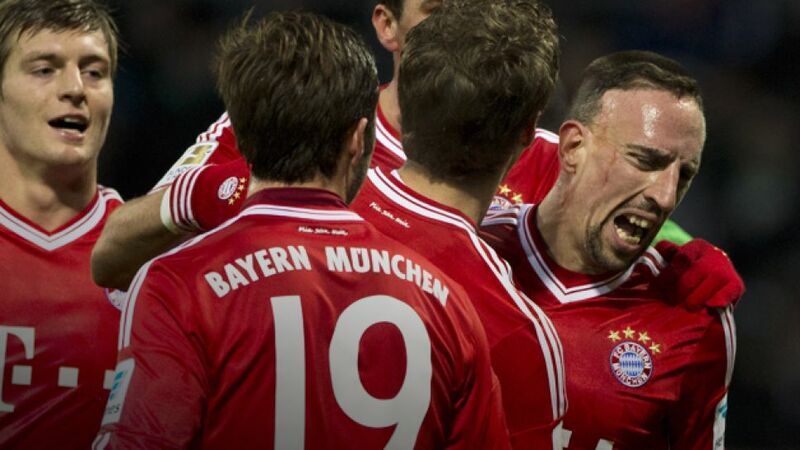 Not content with a four-goal lead, Bayern soon made it five, with that man Ribery once again the instigator of a typically incisive attacking move. The Frenchman’s fierce cross found Götze, who had the presence of mind to send the ball back into the danger zone for Müller to sweep an unstoppable first-time strike past the despairing Wolf. Bayern looked to have saved the best til last as Ribery collected substitute Claudio Pizarro’s deft backheel, exchanged passes with David Alaba and converted his second, only for Götze to get in on the act at the death, compounding 14th-placed Bremen’s misery with virtually the last kick of the game.